Gone are the days when people used Instagram merely because Facebook was too mainstream for them. Over the past few years, this delectable app has received ascending global momentum and is certainly here to stay! Instagram is a mobile-based app which focuses on capturing and sharing visual posts and is a huge hit amongst youngsters. In India, it is mostly used by people below the age of 35 and is a powerful platform to promote the marketing and sales of businesses of all sizes. During 2015, the platform was opened for business and, since then, there has been no looking back! Read on to get a closer insight into the top 15 tools which will come in handy to promote your business on Instagram. This amazing tool helps you find the right following for your business. It provides you with a filtered set of audiences who are most likely to be interested in your business which, in turn, leads to effective targeting. Additionally, it assists you in identifying the most inactive followers, who can later be unfollowed. You can also find followers who follow accounts similar to yours and the list of people who have unfollowed you. Schedugram helps you with scheduling your posts. It queues your posts according to the timeline opted by you and eradicates the need to log in and out every time you want to post something. Furthermore, it has the added key features of managing multiple accounts, content creation and canva integration. Social Insight provides you with an extensive analysis of your posts, focusing on reach and account engagement. You can retrieve useful information like your most liked post, average engagement rate and the increase or decrease in the number of followers. It also gives you a detailed insight into understanding your customers. Additional features include geographical hash tag specific alerts and personalised notification preferences. This handy tool refines your list of followers by classifying them into brand advocates and influencers. Social Rank even helps you create a custom classification to segregate your followers and export the desired profiles to Twitter. Besides this, you can also filter your followers with specific demographic keywords. It gives a complete statistical breakdown of your Instagram followers which is very helpful in promoting your business. Instagram feed WD integrates your Instagram account to Word Press blogs. You can now easily link your posts and photos to your website. It also lets you embed your Instagram feeds of hash tags and users to your website with conditional filters and links. With Instagram Insights, you can get access to the basic analytics of your Instagram business account. It provides you with contact support your customers can use to reach your organisation and helps with promoting the posts as ads. This tool focuses on showcasing your brand. It provides the facility of adding a bio link so that the interested followers can see your photos when they search for content similar to yours. It also provides conversion tracking and inventory management for e-commerce merchandise. The Repost app lets you repost an Instagrammer's photo on your feed. You can also bookmark your photos and save photos or videos to post them later on your feed, with just one touch. Offerpop lets you engage in interactive content with your followers. It is ideal for conducting contests and creating sampling programs. It plays ads and content galleries in user-created feeds to promote brands. This is a business analytics widget that deals with the statistical analysis of post engagement. It monitors the increase or decrease of followers. One special feature about this is that it provides the opportunity to benchmark your performance with that of the competitor’s. It also includes suggestions about the optimal post timings. Like2buy is the shopping-enabled doppelganger of Instagram. The app supports a web page similar to Instagram with the added feature of shopping while scrolling through the pictures. Over is built specifically to help you add text to your images. It has a contemporary style and is a one-stop-shop for anything related to embedding text on your pictures. Additionally, this app is specifically known for its creative and lively UI. People map is another effective Instagram marketing tool which provides you with the detailed analytics of your business. It helps in data-based decision making, finding target influencers, and is much more user-friendly than its counter parts. It also has a very stylish interface that makes it more attractive and fun to work with. Inselly is a simple tool that can redirect a photo to the actual product with the help of the hashtag used. This helps in capturing the attention of a customer, within a short span, by showcasing that the product is on sale. The hashtag denotes that the product is up for grabs and visiting the inselly website will help them find more details of the product. It is about time you leverage Instagram to boost the marketing and sales of your business. With so many handy tools and useful apps, connecting to your target audience is now easier than ever. So, take the plunge and leave your digital footprint on the effervescent platform of social media. This blog was originally published in Business Line on Campus. From merely a selfie-sharing app, Instagram has come a long way and now has over 300 million monthly active users sharing 70 million photos per day that garner over 2.5 billion likes daily. Instagram recently launched a new feature named stories, which has a striking resemblance to Snapchat’s feature of the same name. They are essentially photos and videos that last just a day and just like Snapchat; they can be enhanced with drawings or special filters. Stories are not part of the main feeds and are in a separate space where you can post as frequently as you want without worrying about spamming your friend’s feeds. Wondering how to use this and how you can leverage this feature in your marketing strategy? Worry not! We have the answers. Tap the plus sign in the upper left corner of your screen to get started. Take a picture by clicking on the round icon. If you are looking to make videos, press the round button continuously for 10 seconds. If you don't want to take pictures and want to upload from your existing gallery, just swipe down to choose your photos or videos. Once you are done with taking pictures, you can use one of the three pen options to doodle on your images. Additionally, stories also let's add filters. All you need to do is swipe right. Now that your masterpiece is done, just tap the checkmark icon to share. Your story will now appear on top of your friend’s feeds. It is also visible on your profile page. You can also save this story for later use. All you need to do is open your story and click on the three dots on the bottom right, then selecting "Save Photo." You can see who saw your pictures and videos by swiping up when seeing the photo or video. If you do not want someone seeing it, all you need to do is hit the "X" next to their name to block them from seeing anything you add to your Story. You can also change your privacy settings to make sure certain people on your feeds don’t get to see your stories. Go to the setting icon in your profile and choose to hide your story from certain users or restrict who can respond to it. 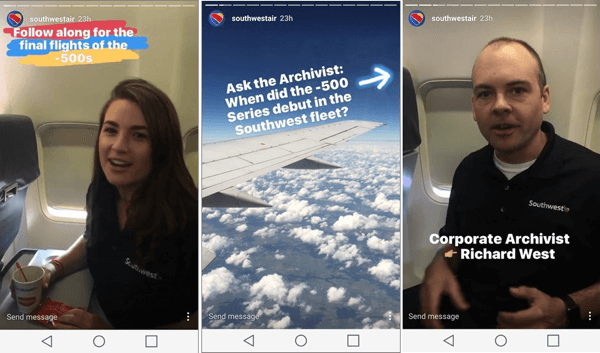 How can brands leverage Instagram stories? After Facebook took over Instagram, Instagram opened up to advertising on their platform, and more brands have started using Instagram for business. Instagram also has an inbuilt analytics tool, which helps you track the most viewed and liked posts, post engagement rate, website clicks and impressions. If your brand already has a fairly decent base, Instagram Stories is something you must quickly jump to create a buzz. Wondering how to leverage stories? Here are a few ideas. One of the best and easiest ways to use this cool, new feature is during an event. Give your audience a sneak peak of what is going on behind the scenes. Be it a photo shoot or just a short video to show how things are working at your office, it is an excellent way to connect with your audience. Here is an example of a brand that leveraged this feature, Mercedes-Benz (@mercedesbenz) shared a compilation of videos and photos of a photo shoot highlighting its Mercedes-AMG model. For any retail brand or e-commerce brand, Instagram stories are an excellent way to announce a sale. With a combination of images and videos, you can send out promotional messages about your upcoming sale. In fact, J-Crew, an American multi-brand retailer did just that. Before their one-day sale of “Jane in Pink”” sunglasses, they took to Instagram Stories to highlight their sale. If you are having an event in your office or if you are just looking to make a big announcement about your brand, take to Stories to tease your audience about it. If you are making your big announcement through Facebook Live videos, you can use stories to notify people about a Facebook Live broadcast to get more viewers for your live video. This is a great way to promote both your platforms at once. If you are looking to promote your product, Instagram stories are a great way to do that. You can not only show how your product works but also show them unique ways to use your product well. This will not only increase visibility but also gives them reasons to buy the product and driving conversions. Be it makeup tutorials with a specific product or styling ideas with a scarf, there is no better way to educate your audience about your product than these stories. 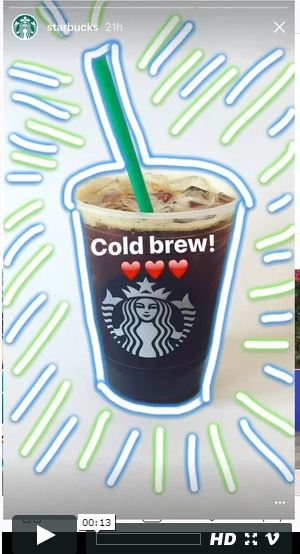 Even Starbucks highlighted its chilled cold brew and iced Americano with cream using Stories. Has your company just turned one or five or did you just win a big award? Well, congratulations! It is important to announce these to your target audience, and this is where Instagram stories come in. Using series of interview video and images, you can create engaging content to highlight your milestone. South West Airline is a classic example of this. When they retired their 737-500 planes, they took to stories to make this announcement. Showcasing these milestones is an excellent way to humanise your brand and keep your audience and potential customers interested in what you do and how you do it. Are you going to be using Instagram stories? Share your thought in the comment section below. This article was originally published in Techstory. Instagram’s growth and spread as a social media platform is literally a tech fairy tale. What started out as a purely recreational app by two young entrepreneurs is now nothing short of a global phenomenon. It’s been 18 months since Facebook acquired Instagram and has estimated 400 million monthly active users. After Facebook’s acquisition, Instagram has opened up advertising opportunities on its platform making it official, that Instagram has truly arrived as a powerful marketing platform. To launch their new kids collection, they have captured the essence of being a child by showcasing a little girl painting on the floor. By choosing to showcase the product in its natural setting instead of a typical product image, Good Earth manages to create a marketing free look while promoting their new collection for children. Ensure that your captions are brief yet engaging. Adding a question always helps to interact with your audience. You can share plenty of behind-the-scene pictures and videos that can let people know about the team that works for the brand. Remember, the more real you are, the better people connect to your brand. Once your Instagram profile creates this fun, creative and organic atmosphere, you can start seeing an increased traffic to your site and curiosity about your product/service. Unlike Facebook and most other social media platforms, Instagram does not allow clickable links on the posts or on the post description. However the profile bio allows you to write a brief about yourself or your business. Use this space to exactly convey what you would like to say to your audiences. Most brands also use a few emojis here to make this section stand out and support the text with some colour. The website link added here is the only way your customer can be redirected from Instagram to your website (other than ads). To subtly push your target audience to engage with your website, blog or your app, end most of your post content with a gentle reminder that the link to reach you is available in the bio. Check out this post by Photo Concierge showcasing stock images directing customers to a link of their choice. Visit the Facebook Ads Manager and create an account. Skip this process if you already have an ad account with Facebook. Select your goal from the options that are offered through Instagram. For instance you can send people to your website, get people to download your app or promote your Facebook post through your Instagram profile. As of now, one cannot promote a post on Instagram unless it is shared on Facebook. Now create the ad on the Facebook ads manager with the image and text of your choice. When you reach the ad format section, you will have the option of deciding if you would like to show your ad on Instagram. Alternately, if you would only like to run your ad on Instagram, make sure that you uncheck the other platforms. Now fix your budget, check the ad preview, hit ‘Place Order’ and your good to go! Like any platform, you need to experiment with various combinations of ads and text to understand which ads are working well with your target demographic. Try the carousel format with multiple pictures or a video ad to get the desired business results. It has been observed that running Facebook ads along with the Instagram ads can reduce your cost per conversion by around 20%. Engagement with your followers is quite hard on a platform like Facebook, but Instagram is the perfect place to really engage with your followers. It’s also a place that is geared more for organic and real conversations. Your followers are a gold mine of potential customers. Creating a loyal fan base is a surefire way to generate customers. Of course, unlike running ads, this process takes a bit of time, effort and patience. Sorting and keeping in touch with followers is vital. Tools like SocialRank are a fantastic way to organize, manage and identify your Instagram followers. SocialRank essentially pulls out the profiles of all your followers and lets you sort them out based on your preferences. You can create lists of your most valuable followers and ensure that you follow them back. A thoughtful message on their special posts can go a long way in ensuring brand affinity. Another interesting way to grow your community is by searching relevant non-followers and liking as well commenting on their posts. Richard Lazazzera, Author of What to Sell Online : The definitive guide, ran a small experiment wherein he shortlisted 100 of his competitors’ followers and liked as well commented on their posts. He managed to get a whopping 34% follow back from this group. This clearly shows that the more effort you put into your Instagram profile, the better are your chances to build a strong and relevant community which in turn helps with business results. Another great way to engage with your users, is by reposting customer content. Most brands heavily rely on this and it’s a great way to make them feel special. Use the Repost app to share your customer’s content and tag them on the post! Infact, there are many tools that help you manage your Instagram profile. Here’s another list of top tools to help you with Instagram. Instagram is a platform where often unfollowing is as important as following! Since following others is a definitive way to increase your reach, you have to constantly unfollow the people who do not engage with you in any way. Some accounts that you follow may have become inactive and can be weeded out. Crowdfire is the perfect app to help keep your account clean. Through its simple dashboard, you can quickly see the number of people who follow/do not follow you. It also pops up the profiles of your recent unfollowers which can help you unfollow them as well. Alternately, it helps you quickly find the list of your competitors to follow. With this dashboard, you can ensure that your account is always fresh and updated! Ideally, each post must have a few from each of these categories. Do not forget to coin a hashtag for your brand and promote it regularly till it can catch on and have its own identity among your customers. Many brands also use clever hashtags to communicate an emotion or trend related to their product. Just like this Starbucks post, where they use the #BeGoodToYourself hashtag along with their tea to indicate a feeling of wellness and indulgence. Here’s a great guide to the most popular hashtags for the year 2016. Instagram influencers are very powerful and have almost the same impact as a popular brand ambassador for your business. Anybody who has a large following and content that interests your customers can be an influencer. The key to getting the most out of influencer marketing is ensuring that it is done using several influencers and within a short time period. Your customer’s memory is short and to ensure that your brand is noticed, a Blitz Krieg approach to influencer marketing can go a long way. This is especially true when you are launching a new product in the market. One of the best case studies to understand the impact of Instagram influencers is the launch of the Uwheel, a self-balancing two-wheeled hoverboard. The co-founder’s girlfriend recruited famous rappers, singers, socialites, and other Instagram influencers to talk about the Uwheel, all at once. Some of the posts and reviews were paid for while some others were given the Uwheel in exchange for a word about their business and product on their profile. And suddenly, Uwheel was all everyone was talking about! Using a marketing budget of $61,200 their team was able to generate a revenue of over 1 million dollars and since then Uwheel as a brand, has not turned back. Read all about it here. Wanted to get started with influencers for your business soon? Here’s a fantastic list of influencers to help you get started! Like all social media platforms, Instagram analytics can help you understand your account and follower behaviour to help optimize your business. Using tools like Social Insight or Iconosquare you can find out more about important analytical points. For instance, the best time to post your content, most engaging content, most engaging filters etc. These tools help generate comprehensive reports that can speak volumes about the user behaviour and help you understand what works and what does not for your Instagram account. With Instagram, consistency is very important. You must keep sharing your content in different forms to be relevant and sustain the community you have built. One way to achieve this is by scheduling your posts in advance. Use tools like Schedugram and Latergramme so that your workload does not stop you from posting regularly on Instagram. However, do remember that the name Instagram is inspired from the act of capturing a moment the instant it happens. Nothing works better than taking a picture while as it happens and sharing it immediately with your followers. A successful sales figure, a new product launch, a new business venture – share it when it takes place! During a recent interview, Eva Chen, Instagram’s Head of Fashion Partnerships, speaks about how Instagram is more than just a numbers game and airbrushed photographs. Even grainy but real videos that were taken in poor lighting can do well on Instagram if they truly capture real life. So don’t be afraid to share it all. Here are some more interesting case studies about using Instagram for business. Instagram is truly a treasure trove of new opportunities to expand your business and generate revenue. While it does work better for businesses that are more visual in nature, it still is emerging as the number one way to interact with the younger audiences with great spending potential. Have you tried to use Instagram for your business? We would love hear from you in our comments section! Instagram allows companies to tell a visual story, to develop brands and to be engaged with customers. But just 28% of marketers currently use Instagram for their businesses. Popularity of Instagram in Google Trends shows a really fast growth for the last years. So it’s time to start with Instagram marketing. Here is a list of top 10 tools to help your business to build, manage and grow a strong presence on Instagram. Iconosquare is one of the leading analytical tools for Instagram. It allows you to manage your Instagram activity, analyze your performance and engage your customers. 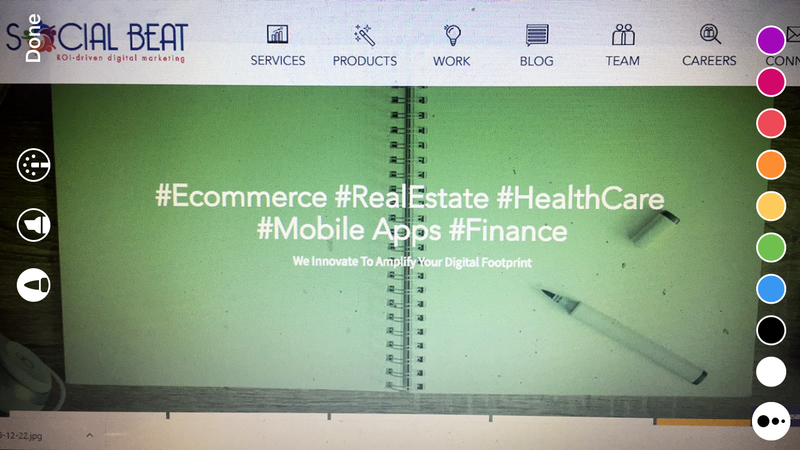 With this tool, you can track which top hashtags are being used on Instagram, get detailed dashboards with graphics on engagement with users and use comprehensive tools including functionality to create contests. Is Instagram a part of your social media marketing? Schedugram, a startup in Australia, is an excellent tool for Instagram users and social media managers to manage multiple Instagram accounts. Instagram was designed as a mobile tool, but Schedugram gives the opportunity to post pics from your desktop or laptop. It allows you to schedule your posts and post photos as well as videos. You can also edit your pictures, including cropping, adding filters, adding light and saturation properties and other cool effects before posting. Repost app is a good tool to make customers feel involved and appreciated. This application allows brands to demonstrate their user-generated content. Search a photo you like and easily repost it. 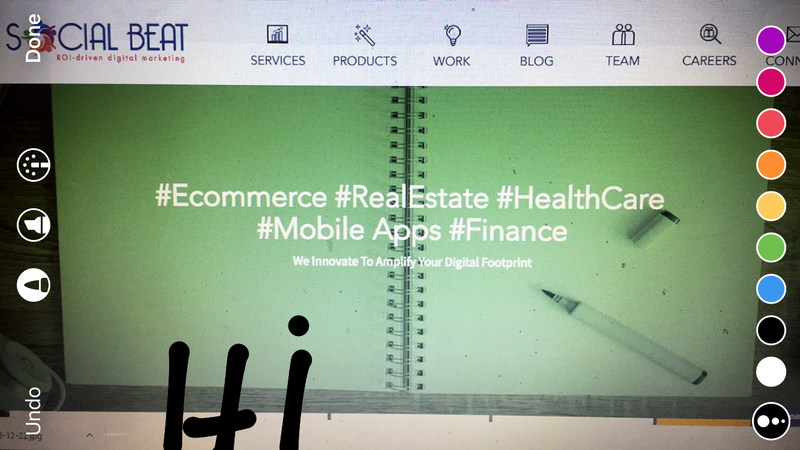 You can find your customers by hashtags and follow them. Appreciate your customers by mentioning them on your page, to earn customer loyalty. Like2buy is “Instagram's missing link”, a tool to sell products on Instagram. This app gives an opportunity to drive traffic and revenue from Instagram. Like2buy transform images into gallery of products, available for purchase with a click. User should clicks on the link and it will take them to a page of the brand’s featured products. Tapshop also helps your Instagram followers in shopping. With Tapshop, you can make any image in your brand gallery shoppable by adding a product or category page link. Once your fans find a custom page of their desirable products, they will get an email with direct links to your product pages. Wispond is Instagram Hashtag Contest App. Gather Instagram photos and showcase them in a voting gallery on your Facebook page, website or mobile. Invite followers to submit their photos from Instagram and vote on their favourite ones. Add Instagram contests into your marketing plan to give your channels a viral impulse. Create, share and discover fun photo-video stories along with your favourite music! Flipagram allows you to make slideshows, musical videos, stop-motion effects and more, with millions of free music clips for your Instagram page. You can demonstrate how one of your products can be used in different ways or create a slideshow with interesting photos with your team. The more pictures you have, the better the effect. Piclab is a tool that allows you to add text to your pictures. If you want to have written information on our images this is a perfect programm to do it. Choose from different fonts, shapes, put stunning filters and photo effects, and add a collection of textures, borders, patterns, and more to your photos. Hyperlapse is owned by Instagram and creates beautiful time lapse movies. Capture video, choose the acceleration (from 2 to 12 times) and the program will do the rest for you. The video helps in making a nice video that is easy to share with your followers. Instagram for Business is one of the best places for businesses to find tools to grow their brands. The Instagram for Business blog has tips, brand spotlights, case studies, and news from Instagram. Use Instagram's visual language to create your visual story and drive business growth. Instagram is a powerful tool to connect with consumers and build a community. The key is to stay authentic to your brand and create content and engage with your customers. This will ensure that users not only “follow you” on Instagram, but also become your brand advocates. If your brand has visually appealing products or a unique story to tell, there cannot be a better stage than Instagram. From luxury brands to media houses to automotives, each have carved a niche of their own and are leveraging Instagram for their businesses. In fact, automotive brands are the most engaged and well-represented. Lot of marketers contemplate whether Instagram can be an effective social media platform for their brand? Even if many marketers want to leverage Instagram for their business, they lack a quick guide that has the tips to build a successful presence on Instagram. A quick look at the above stats convey the fact that 50% of the sales funnel can be readily delivered to potential customers even before they step into your store. This raises an important question: does the might of premium luxury brand correlate to the might on digital platforms like Instagram? Hermes, that promotes a lifestyle rather than products, have leveraged videos, short poetic films on Instagram that strikes profound luxurious experiences. For brands like Gucci & Louis Vuitton, the majority of posts revolve around showcasing new collections and designs and getting engagement for the same. In many cases, they have also leveraged digital influencers to promote the products by tagging them and showcasing shots taken by them. Tiffany is another brand that a strong following on Instagram that is just not nominal. The strength of relationship can be gauged from the fact that the engagement on follower base is the highest among the brands mentioned. Let us look at some top tips to help build a strong Instagram presence. 1. Long captions aren’t a big NO! Including hashtags, the average caption length on Instagram is 135-140 characters which marks a significant focus from brands to avoid long captions. But there is no apparent proof of lower engagement rates for posts with lengthier captions as long as it adds to the visual story of the post. 2. Hashtags rule the roost! Hashtags allow access to specific interest groups and they are a great way to mark content that are discoverable organically. Instagram allows up to 30 hashtags to be used, and studies show that posts with at least one hashtag get ~12% more engagement. Then, there’s no reason to shy away from using them. 3. Caption content is a NECESSARY integral! @mentions generally results in more engagement underlying the fact that though the caption length may be immaterial, caption content definitely matters. The posts tagged with location gets ~30% more engagement when compared to their orphan counterparts because there are multiple apps and 3rd party discovery tools that allows location-based searches and content discovery. It’s good to mix the content form and it’s true for any channel. On its own, videos are a great form of content but cannot replace photos on Instagram. Hence, it’s suggested to focus on photos as the central pillar of your Instagram strategy. A simple CTA like "select the design you like most" or "Tag your friend who would like this" would be ideal to help boost the number of comments and tags your post gets. The virality of your post has an exponential relationship with the number of comments and tags you get. Instagram is cool, but it isn’t for our business! Does this quote have any resemblance to your boardroom discussions on your marketing strategy? The apprehensions are misplaced. If your brand doesn’t have glamorous models to endorse your product or a Louis Vuitton bag to display, then does your brand have a place on Instagram? The answer is YES. There are ample examples of brands who lack stunning images but have succeeded in creating an engaged audience on sheer basis of their creative prowess and evoking original content. From Google to conglomerates like GE to tractor manufacturers like John Deere, most brands are fast coming on Instagram and have many have quickly built an engaging community around their brand. In fact, General Electric is one of the biggest B2B companies on Instagram with ~180000 followers. Intel definitely needs a mention considering the impressive posts that showcase their products and common problems to solve using technology. This gains good traction as it’s not just hard-selling Intel’s products. In recent times, Instagram has emerged as an effective platform for the hospitality industry with players like Raintree Hotels leveraging geo-location tracking to get walk-ins & bookings. The total engagement is the sum of likes and comments garnered by your posts. This gives basic insights on how well your strategy has worked to keep your audience active. When some posts get impressive engagement while others fall flat, this metric can work as a good measure to optimize the content being pushed on the basis of what is working well with your audience. In a given time period, the total engagement gained divided by the total followers shows engagement as a %age of followers; which can be used to study the period-on-period impact of your strategy. This is only applicable in case of unique hashtag campaigns with affinity to our brand. In such cases, it’s a fair measure of how ‘viral’ your campaign has been. This is an important metric to track the popularity of your Instagram account. The higher the number of followers, the better the chances are of gaining engagements on your post, thus boosting the other metrics discussed here. It’s the rate of growth of followers, period-on-period; that can act as an essential measure to track the best performing campaigns and content types. In case you would like any other information to be included that can be helpful for marketing businesses by leverage Instagram, please do let us know your thoughts as a comment to the post. We shall be more than happy to explore your feedback.